Nice to see a post from Matthew. Lets have a few more posts all round..
December was interesting Yellow-line Quaker persisted in the first week and as Matthew points out Dark Arches were caught. These are interesting catches being found around the coast at the end of the year (a few inland) which suggests they could be immigrants. They are often in catches that include other species known to migrate. It has been poor for me with the Umbers but as others have found, Spring Usher and Pale Brindled Beauty appeared late in December. The 31st turned up the last Dark sword-grass of the year and the 30th turned up a micro that I put down as Acleris hastiana but was unusual. 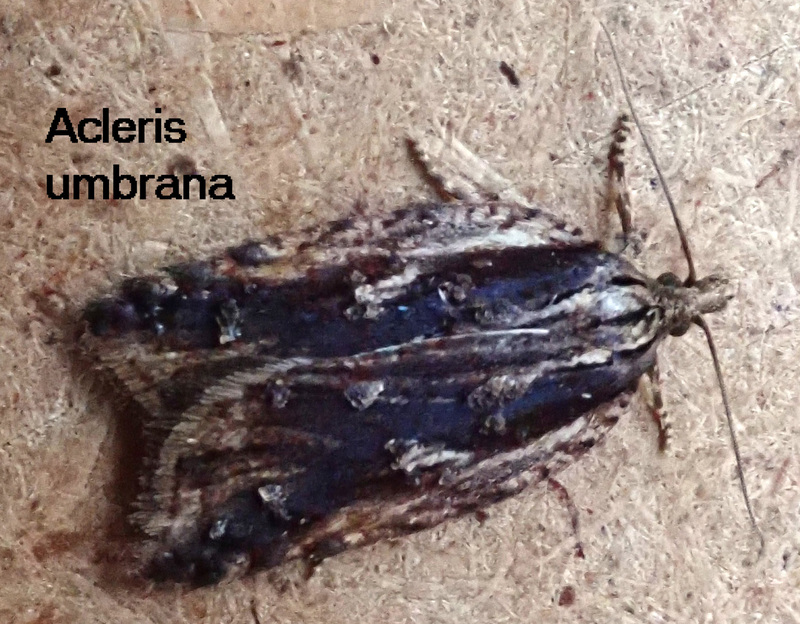 I posted it on Facebook and that straightway got a correction from Steve Nash and Paul Kitchener that is was actually Acleris umbrana. Quite a catch. The nearest modern record to Suffolk is East Sussex in 2009. Otherwise it is found in the south west (Hampshire to Monmouthshire). 2018 started slowly and as summer approached catches were low and late so the peak numbers turned up in August rather than July as usual. Catches were reasonable then through to the end of the year. Total species caught in 2018 for me turned out the same as in 2017 and I picked up 35 species new to my home site. This brings my site total to 1075 species. 2013- 745, 2014- 726, 2015- 738, 2016- 751 (35), 2017- 769, (32) and 2018- 769, (35). To me 2018 saw the impact of climate change. I see this as the spread of species to Suffolk from further south, such as Coleophora amethystinella, Acleris schalleriana, Dotted Chestnut. Also establishing resident populations of immigrant species and their range increasing. Caloptilia hemidactylella, Oncocera semirubella, Cydia inquinatana (now reached Ipswich), Catoptria verellus (also at Waveney sites and in Essex), Cydalima perspectalis, Clancy’s Rustic and Clifden Nonpareil. Less clear on residency but look like they will at some stage might include Oak Processionary, White-speck, Oak Rustic and Blair’s Wainscot. Only time will tell! There are others that could be added to the list though proving any listed as being resident is less easy that making rash assumptions! Happy 2019 to all and good mothing. Sadly Raymond I feel there has been a noticeable continuing decline in people posting on this blog during the last year. I’m guessing that a lack of time could be one reason (certainly so in my case). 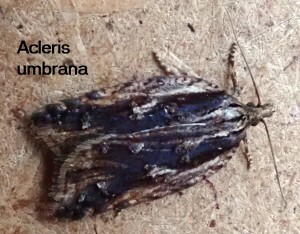 Also, with the plethora of social networks now people can turn to those for ids etc as an instant answer can come back as in your case with the Acleris umbrana. I could be wrong and things may pick up again in 2019, time will tell.